November 02, 2013, 10:49 a.m. Since the recession and subsequent austerity measures a sharper focus has been placed on what those in the public sector earn. Last month ministers criticised NHS contracts which allow doctors to receive pay rises of up to 9% despite constraints on public spending, and when the IPSA recommended an 11% for MPs in March there was widespread outrage, even amongst some MPs. And the scrutiny is not confined to the public sector: figures from the US show that the 10 highest-paid CEOs in America earned over £100m each last year, with CEO pay growing 15 times faster than that of workers. YouGov research has revealed the public think those on lower incomes such as nurses are teachers are underpaid and those on higher incomes such as CEOs, MPs and doctors are overpaid. The public think that MPs earn £61,000, £21,000 more than what they should (but still £5,400 less than their actual salary of £66,400). The average salary of a family doctor is £75,000 according to the public, £15,000 more than what it should be. 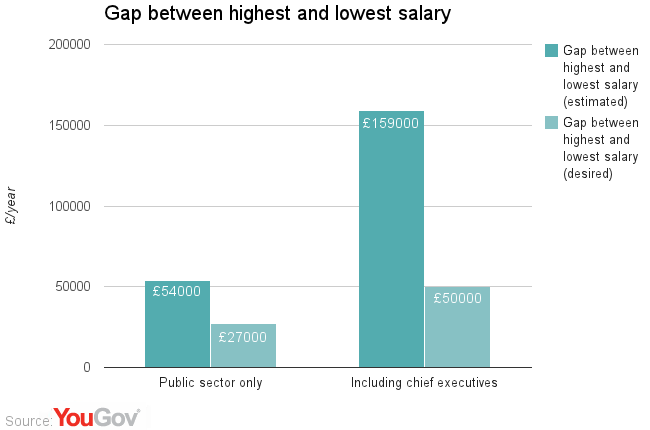 However the profession which is perceived to be most overpaid is one in the private sector: chief executives, whom people think earn an average pay of £180,000 but should earn less than half that (£75000). On the other hand the public think that nurses earn £21,000, £7,000 less than what they should (£28,000) and teachers earn £25,000, £5,000 less than what they should (£30,000). The public also think there should be a smaller discrepancy between high and low earners. According to perceived salaries, there is a pay gap of £159,000 between the highest (chief executives) and lowest (nurses) paid professions in the survey, but according to desired salaries the gap should be only £50,000. This effect is also pronounced when it comes to the public sector only, with the public preferring a pay gap of £27,000, with family doctors on £55,000, nurses on £28,000 and MPs somewhere in the middle (£40,000). The preferred salary for an MP was just £10,000 more than teachers. 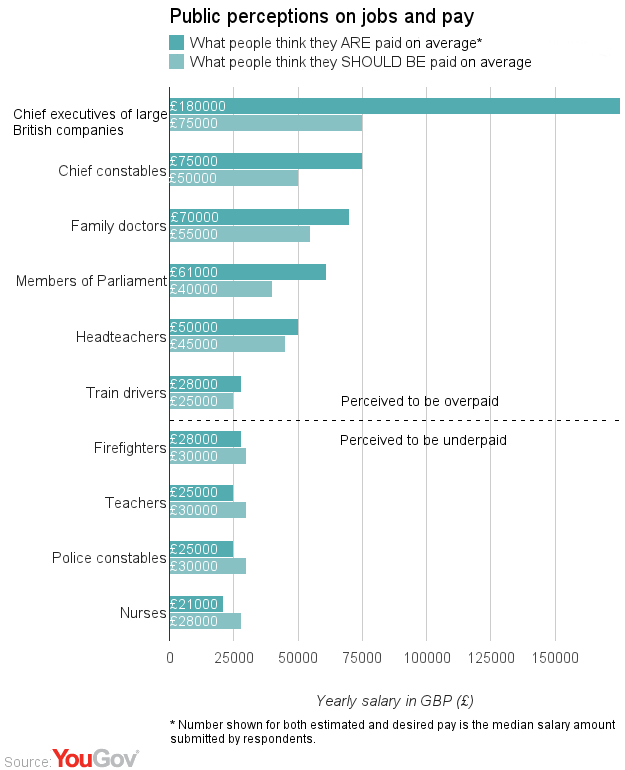 Fire-fighters (£30,000) and £12,000 more than nurses (£28,000). Head teachers (£45,000), Chief Constables (£50,000) and family doctors (£55,000) should all earn more than MPs according to the public. The research on perceived and desired salaries expands upon the findings of a survey YouGov conducted in May, which asked British people directly whether certain professionals are overpaid or underpaid. Very high-paid professionals such as chief executives and TV presenters topped the list of those &apos;paid too much&apos;, while nurses and shop assistants topped the list of those &apos;paid too little&apos;.